We carved pumpkins with the kids last night, this was actually the second set of pumpkins carved, the first set was done several weeks ago and had to be thrown out. They got nasty. The kids were very worried about having them for Halloween so we made another set. Sadly I didn't get pictures of the first round, but these turned out pretty good. 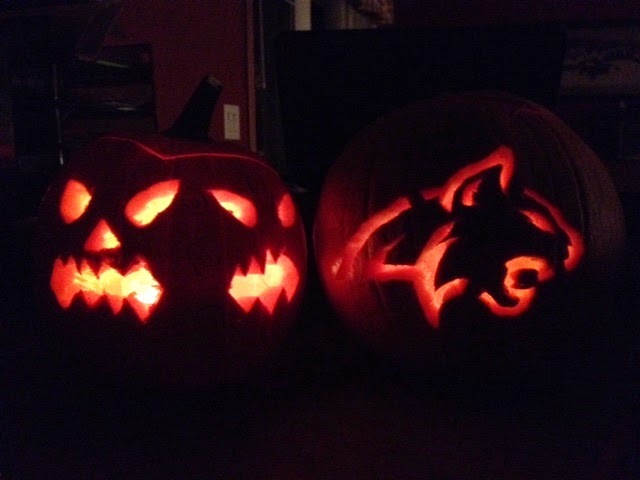 My daughter designed hers (on the left) and I found the Bobcat stencil for my son who is a huge Montana State football fan. I did my first set of intervals in forever yesterday. 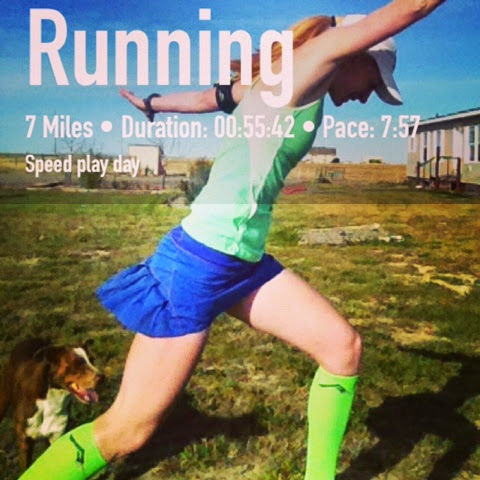 I was feeling a little sluggish when I ran my warmup miles so I didn't know how well the workout would go. It ended up feeling great, sometimes the legs just need some speed! I did a 2 mile warm up at about 9 minute pace and then quarter mile intervals with quarter mile recoveries x8 and then a 1 mile "cooldown". I put cool down in parenthesis because it was at 7:35 pace. It just felt good! Then I mowed the lawn for hopefully the last time this year. It was very overdue and the lawn looks so much better! My next race is a 5k on my birthday which coincidentally is Thanksgiving this year. I know it won't be a PR attempt, but I haven't run a 5k this year at all! One 5 mile, one 10k, 3 half marathons, and a relay. I do want to make a decent attempt at it though, hence the intervals. I will keep trying to get them in once a week until Thanksgiving. I have been good so far about not running anything over an hour, which is my plan until after the new year sometime. This for me means about 7 miles give or take. 7 miles is kind of my run happy spot anyway. 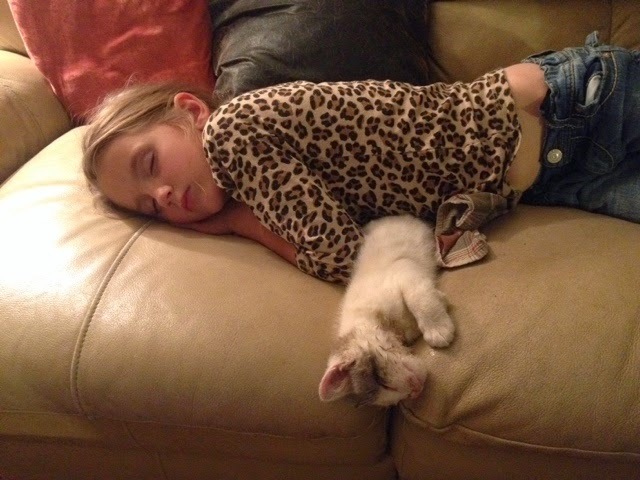 Little cowgirl was apparently worn out as she fell asleep early last night snuggled up with Runty. A girl's got to get her beauty sleep to get ready for tonight! What is your run happy spot? Curious why you're trying to run no more than an hour. Do you mind explaining? We did not carve pumpkins at my house this year. We just kind of ran out of time and forgot about it. But then, we don't have kids, and I am fairly certain our dog (who we treat like he is our child!) does not care about pumpkins! Our pumpkins are just barely going to make it!! It got really mild this week and they've gotten pretty yucky! Aww, cute sleeping buddies ;) I like to run a 10K for me that's about an hour. Last winter the 15K became my favorite distance, but i lost it when it got hot here, maybe I will build back to that this winter ;) The pumpkins look awesome! Cute running outfit! I seriously love that photo of you! And great job on the pumpkins. We (and by we I mean me) did ours last weekend. My 3-year-old had not done them before so we didn't have the urge to do them early. Next year might be different! Yes, The Captain carved our pumpkin yesterday and we lit it last night. I love your picture! Super cute pumpkins. I didn't carve any this year. Just couldn't get into the Halloween spirit. I cannot believe you have tank top weather for running. We are having a cold spell here with expected freezing tonight. Love your pic! I almost bought that blue skirt too - so wish I did now cos it looks awesome on you! I'm wearing the black version in my race tomorrow! Great job on the pumpkins! We did a few pumpkins, and my mom sent some ghost squash to carve. That was a first for me. I wish we would have taken more time for pumpkin carving/lighting this year but as with our costumes, we had a lamer year compared to some in the past. I love this picture of your little cowgirl...so cute!! Just a day in the life, but I did run.